I’ve decided to take on Strybe’s challenge of reading more books. I started this last year thanks to my good friend and regular commenter Samwise Gidding’s post, challenging himself to read a book a month. I actually managed it. I read a book in a month. But then I didn’t read anymore. I counteracted this by dropping book related hints to everyone over the festive period and managed to gather a good haul of books. I thought I would read at least one of them in the week before New Year but instead I just loafed around and watched old movies on telly. What a massive waste of time. January is shooting by and I’ve yet to even turn a single page. And the missus got “Kraken” by China Mieville that I really want to read; as well as his entire back catalogue. “A Game Of Thrones” was recommended by the fore mentioned Sam and I really want it to get it read before the TV show comes out on Sky Atlantic (How great does that look?) as I hate reading a book after watching the adaptation. Doing this is going to be more tricky than it sounds as I’m really, really tempted by “Blood Meridian”. The first paragraph was as much as I read and it was fantastic. Cormac manages to fit so much emotion and character into such a compact space. I leave this blog post undecided. I have cleared space on my desk to attract my attention away from the likes of reddit but here’s hoping it works. 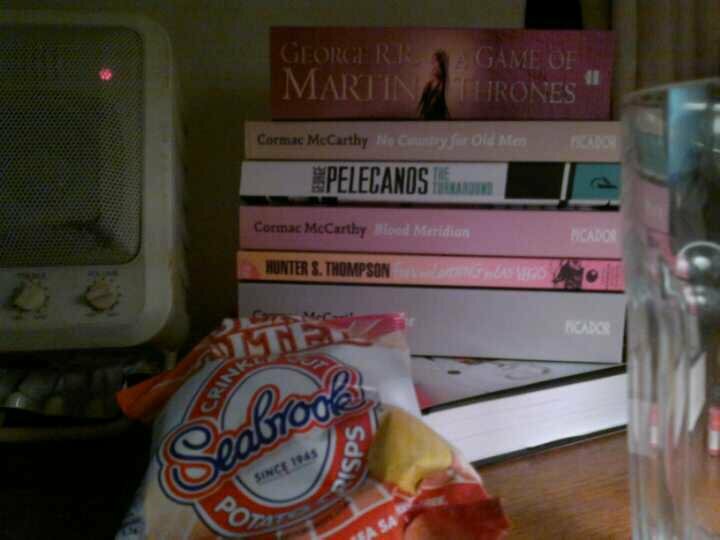 This entry was posted in Books and tagged cormac mccarthy, procrastination, Reading by Steven Wright. Bookmark the permalink. Thanks, I’ll definitely look that up. For me it’s more setting the time aside. I can devour a book in a day once I get myself started, just need to give myself that hour of peace and quiet to get to it. Thanks again for the comment and good luck in your book challenge! Good luck in your literary endeavours, squire. Don’t start with Blood Meridian, though. It’s an astonishing piece of work, but it’s so heavy. It’ll weight your brain down and melt your mind’s eye. In a good way. But for this reason, it’s possibly not the best to start with. Start with something a bit pacier, bit more accessible. Game of Thrones (as pictured in your… er… picture) is good bet. When I was really starting to get back into it all, I found it quite important to work my way up to a few of the meatier books. Re-train those mental muscles, man. So many adventures, so many amazing characters to meet! It’s all rather exciting. I finished reading Nerd Do Well last week, really enjoyable book 🙂 Pegg comes across as quite humble and has some interesting thoughts on various films, not just his own. I’m a big, fan so I’m really looking forward to reading it. His rare articles, interviews and Twitter ramblings shows how much he knows about his craft.